Justin Ong is the President of the Young Reformers, the youth wing of the Reform Party. 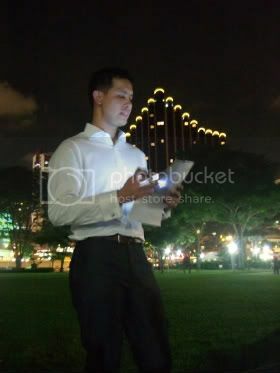 This speech was delivered on 5 Jan 2010 at Speaker’s Corner during a JBJ Birthday Memorial. Today we mark the occasion of the late Mr. JB Jeyaretnam’s 83rd birthday. I would like to take this opportunity to say a few words about this great man, who incidentally happens to be the founder of the Reform Party, as well as a great inspiration in my life. The purpose of my speech is not to idealize the man, or enlarge in death beyond what he was in life; but simply to remember him as he lived. Like many others from my generation, I had come to know Mr. JB Jeyaretnam not through his election campaigns or his parliamentary speeches. Instead, I had become acquainted with JBJ through his legal battles which were often reported in the newspapers. Somehow, it piqued my curiosity and interest in politics, and this eventually led me to join the party which he founded in the middle of 2008. I first met Mr. JB Jeyaretnam in 2005, at Raffles City Shopping Centre, where he was out as usual, peddling his book, “The Hatchet Man of Singapore”. Almost eighty and lost in a political wilderness of his own, Mr. Jeyaretnam was hunched forward and looking on sternly at the crowd as curious pedestrians whizzed by in nonchalance. I remember the day clearly: it was a blazingly hot afternoon and Mr. Jeyaretnam wore on his face a grimace which signaled that the weather had somehow gotten to his mood. However, the frown on his face immediately lightened up into a smile when I approached him to purchase his book and autograph my copy. Although he looked the part of a wounded lion with his better days past him, it was remarkable to me how he was ever so cheerful and without a hint of bitterness in him despite his personal troubles. As most people constantly mistake me for a tourist, Mr. Jeyaretnam, too, took me to be a curious traveler. Instead of complaining to me how the political system had marginalized him and caused him to be in the sorry state that he was, Mr. Jeyaretnam kindly and politely took the time to explain a little about the history of Modern Singapore, even referencing a Discovery Channel Documentary programme about Singapore that I should watch when I get back. What struck me about Mr. Jeyaretnam was the true patriot that he was: a man who loved his country and his fellow citizens dearly. In my mind, there was no doubt that Mr. JB Jeyaretnam, like David Marshall, would make the most eminent of statesmen for Singapore, keeping the flag of Singapore flying high even in the lowest tides of their lives. This day, the fifth of January 2010, I fondly remember the man who was the conscience of Singapore, a man who was persistently dogged in living his political ideals, a man who never once flinched from his duty to serve his fellow citizens. Looking back on his life, Mr. Jeyaretnam serves as a personal inspiration to me, a figure who inspires in times of trouble and uncertainty. Although Mr. Jeyaretnam’s life had been testament to the difficulties in challenging the boundaries of the status quo, those who share his vision must move against the tide of apathy and take up the call to true reform. This day, invite you all to share with me the memory of this fearless fighter, whose indomitable spirit continues to endure and inspire!